As a parent I am always on the look out for healthy alternatives and new food options for boys to try so when Yu asked if we would like to try a selection of there healthy snack I couldn't resist. First up we tried the Fruity chews these are 100% fruit with less than 90 calories, fat free and no added sugar. The perfect little healthy snack, hopefully looking enough like sweets to trick my Liam into eating them. As anything that is fruit Liam refuses to eat, I popped a packet of the strawberry flavour into a bowl for him, not actually having high expectations but he actually ate them all he loved them, he was also asking for more that's a result. The little fruit chews are a fantastic idea for pack lunch, for school or for a treat when going on an outing in the car. Needless to say the other two flavours didn't last long I had to split the bags between the boys they both loved them. Flavours in this range are strawberry, mango, blueberry, blackcurrant and cherry. Next up I tried the strawberry fruit Yu bar, the bar is guaranteed to have 40% fruit inside and is then coated in yogurt, I didn't want to share the bar with the boys I am always running around most of the time so having a fruit bar to eat was perfect as I could munch it whilst I was getting my jobs done, plus its healthy and convenient which I think is what all parents need with active children and lifestyles. The taste it was delicious not to sweet, I have to say I could have eaten another couple I really liked it. other flavours in range include strawberry, blueberry, blackcurrant and cherry. Last but not least the granola and strawberry snacks, these are crunchy cereal and fruit pieces covered in yogurt, they tasted great Liam wouldn't try any because he is fussy but Adam had one and soon was asking for "more" they are packed full of taste and flavour the perfect snack and at just 99 calories for the bag it cant be much better healthy and tasty. These snacks are ideal for lunch box treats! 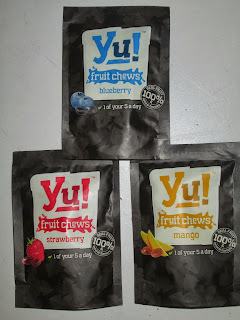 Overall I thought the Yu range of snacks were fantastic all bursting with flavour and healthy which is always great to see Yu healthy snacks are available to purchase in Waitrose, Tesco and Sainsburys right now and its definitely worth giving these great snacks a try! 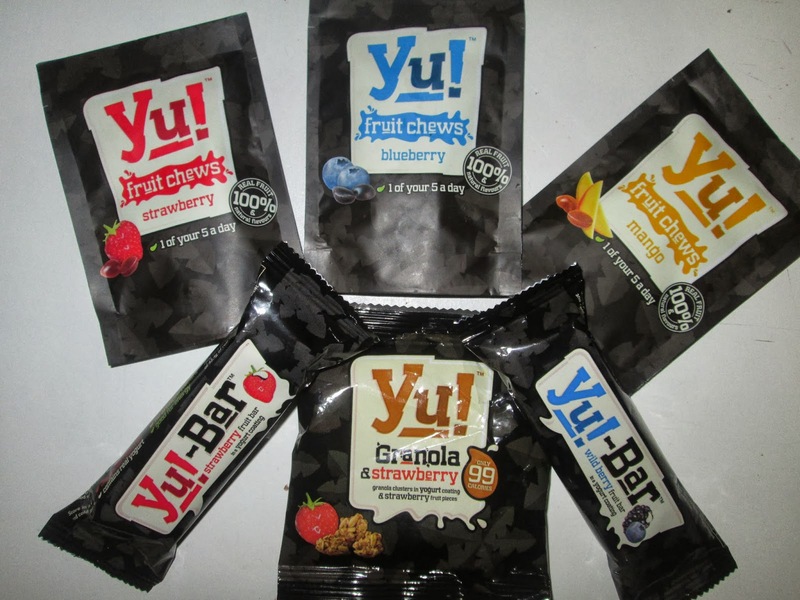 The people over at Yu Healthy Snacks have kindly offered to give you the chance to win some of theses fantastic flavour filled snacks so what are you waiting for!! You can enter via the rafflecopter widget below entries will be checked so make sure you enter correctly good luck! yes we loved them too there almost naughty being so sweet! And were always on the run perfect for muching when your doing the school run! I love the sound of the strawberry bar! good choice I loved it! yes its definitely up their with the top two! these I still cant believe there healthy they are delicious! The blueberry fruit chews sound nice. I actually didn't think I would like these but there super nice! yes yes definitely they make great handbag fillers for when your on the hop! they are delicious i can definitely recommend them! I would love to try blueberries chews. I love healthy food. I love healthy food to these taste like something naughty so its win win! oh yes you must try it its great! The blueberry bar sounds lush! mmm yes its yummy great choice! Like the idea of the Granola and Strawberry snacks. I LOVE Granola so the Granola & Strawberry snacks sound right up my street! The mango fruit chews sound lovely! yes they are great for snacks when you out and about! Strawberry fruit yu bar....heaven in a bar! Mmm. Wild Berry for me! The granola and strawberry snacks sound lovely and so much better than sweets or crisps. The Granola and Strawberry snacks! The strawberry bar sounds delicious! oooh - granola and mango sounds yummy. Yu fruit chews blueberry flavour, they sound delicious! Granola and strawberry snacks sound deeeeeeelicious! The Wild Berry Bar sounds lush! I've never seen these before and they look great, the strawberry bar sounds the yummiest. The mango fruit chews look good!